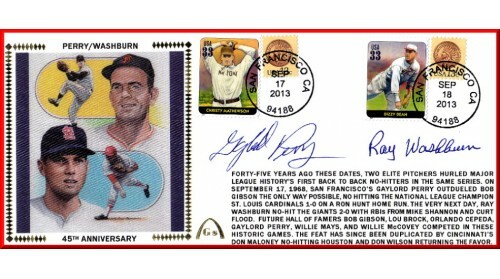 Gaylord Perry & Ray Washburn Autographed 45th Anniversary. When San Francisco’s Gaylord Perry Pitched A 1-0 No-Hitter Against Bob Gibson And The St. Louis Cardinals, It Was News. BUT, The Very Next Day, Even Bigger News Occurred When Cardinals Right-Hander Ray Washburn Returned The Favor Against The Giants. It Was The First Time In Major League History Back-To-Back No-Hitters Had Been Thrown By Two Different Pitchers And Has Been Duplicated Only One Ttime Since By Cincinnati’s Jim Maloney And Houston’s Don Wilson. This Is A Large #10 Envelope Already Autographed By Both Perry And Washburn. Gateway Will Apply Two Sets Of Stamps So We Can Get The September 17th Date For Perry And The Second Set Of Stamps For September 18th For Washburn in San Francisco. This Just Happens To Be The 45th Anniversary Of This Historic Event.